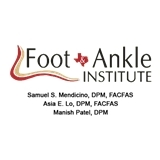 Foot and Ankle Institute (Sugar Land) - Book Appointment Online! If you are looking for an Ankle & Foot Doctor in Houston, TX, we welcome you to our practice. Your selection of the Doctor who will be treating your ankle and foot is an important decision that should not be taken lightly. This decision is as important as choosing your family practitioner, cardiologist, or any other of your health care providers. Most people take their ankles and feet for granted, but imagine being in pain with every step you take for the rest of your life. The Doctors and Staff at the Foot & Ankle Institute understand the importance of healthy, painless ankles and feet for maintaining a quality, active lifestyle. To us your ankles and feet are as important as your hands, heart and the rest of your body. Our Doctors are nationally and internationally known educators who stay current with the latest medical and surgical techniques for the treatment of ankle and foot. Always on time. Bring a sweater, always freezing in there!